Who doesn’t love wine and chocolate for Valentine’s Day? When thoughtfully paired, wine and chocolate bring out the best in each other thanks in large part to chocolate’s simultaneously sweet, smoky, bitter and acidic flavors. The natural tannins in the cocoa prime the palate for the tannins in the wine, allowing the other flavors in the wine to shine. Not sure which chocolate and wine pairing will best woo your loved one this Valentine’s Day? Chef Jackie Blevins has created a decadent recipe for Dark Chocolate Truffles that you can make at home and enjoy all month long. These pair beautifully with Big Smooth Zinfandel, available in our retail shop. Stop by to see our entire selection of wines, you may just discover your new favorite. SALUD! To health and love – and time to enjoy it! Place cream and instant coffee in a small saucepan and bring to simmer over low heat. Turn off heat and stir in chocolate chips until smooth. Stir in liqueur or extract. Allow to cool to room temperature, then refrigerate for approximately 20 minutes or until slightly firm. Using a spoon, scoop out rounded teaspoons and place on a parchment lined baking sheet. Use your hands to form each ball of chocolate into smooth round balls. Roll each in cocoa powder. Store in refrigerator. Will keep for several weeks. 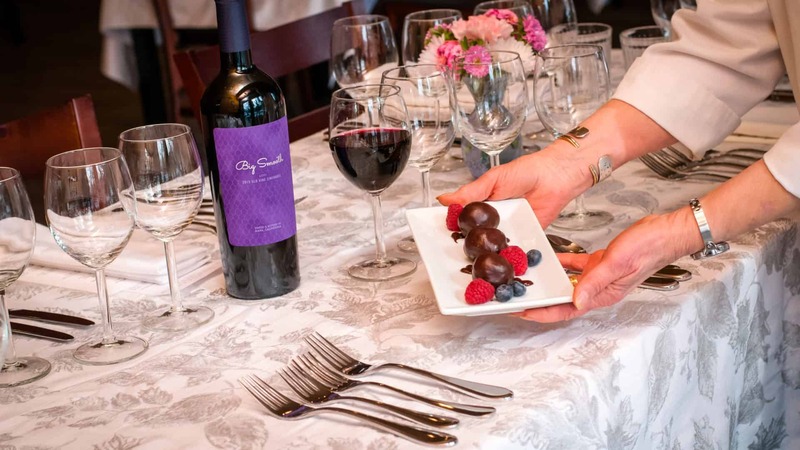 Want to host your own Valentine’s Day wine and chocolate tasting? 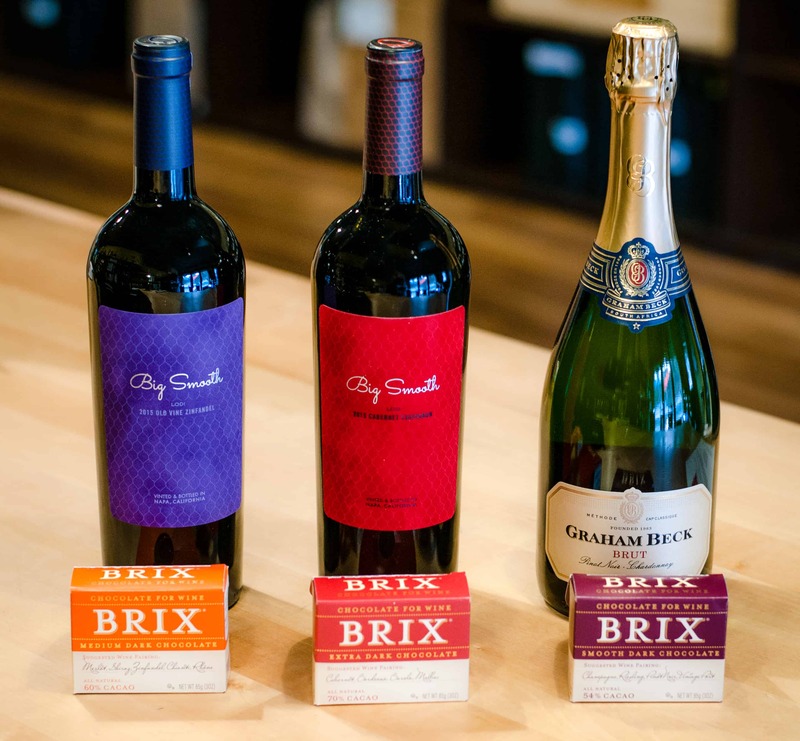 Bosu’s Wine Shop has you covered with our selection of Brix Chocolate, the first chocolates specifically blended to compliment wine without confusing the palate. We have three perfectly paired wines in our retail shop, Big Smooth Zinfandel, Big Smooth Cabernet Sauvignon and Graham Beck Brut. Plan Ahead—Chocolate should be at room temperature and the wine at the temperature recommended for the varietal. Before tasting, cleanse your palate with a bland cracker or room temperature water. Taste the Wine First—Swirl around to coat the side of the glass and release the aromas. Put your nose close to the glass. What scents do you detect? Now sip the wine by swirling in your mouth and notice the various flavors. When you’re finished, cleanse your palate. Savor the Chocolate—Break off a bite-size piece. Take in the aroma and identify the smells (Berry? Spice?). Examine the rich color. Place the chocolate in your mouth and let it slowly dissolve. Notice the different flavor notes and texture. Now the Wine Again—Swirl in your mouth so it blends with the chocolate. How have the flavors of the wine and chocolate changed? Are any of the notes in the wine more evident? Repeat—Cleanse the palate between tastings. Bosu’s Wine Shop & Secret Wine Bar is located in the heart of historic downtown Waynesville, NC, also known as the “Gateway to the Smokies.” Like the south itself, Bosu’s is an exercise in contradiction. The shop is at once laid back and full of energy. From award-winning small production wines, to unique brewery favorites, you’ll find something for every palate and budget. Our inventory is carefully curated by years of experience and a discerning palate. For more than 20 years, we’ve been selling the most versatile, well-vetted offerings designed to please both the novice and the expert wine drinker. Stop by 138 Miller Street in downtown Waynesville and peruse our shelves. Enjoy wine by the glass in our cozy salon. Talk tasting notes and wine pairings with our knowledgeable staff. Join us for one of our weekly drop-in wine tastings. Make a reservation for a seated event. Join our Wine Club (seasonal resident option available). Visit www.WaynesvilleWine.com and discover why we’re Waynesville’s favorite boutique wine, beer and gourmet retailer; a cozy spot where locals and visitors alike enjoy weekly wine tastings & fascinating conversation. Like us on Instagram and Facebook for event news, food and wine pairing suggestions and tasting notes.